In the last decade, drones have gone from the stuff of dystopian sci-fi to an integral piece of technology. Drones are changing agriculture, disaster relief, home delivery, filmmaking, and more. And they’re also extremely popular with hobbyists. A couple of years ago, my young cousin showed me the drone he bought with his Christmas money, and I’ve been low-key wanting one for myself ever since. Then last week, my wife surprised me with the Holy Stone F181 Quadcopter. And this thing is all kinds of fun. The first thing I noticed when I pulled the Holy Stone out of the box was the way it looks. And this thing looks great. 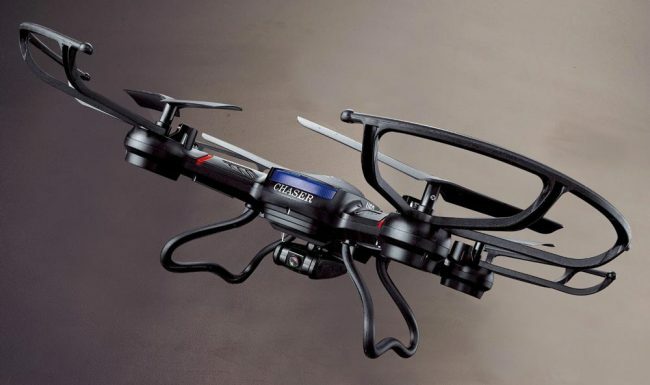 While many entry-level drones look cheap or toy-like, the Holy Stone is all business. Its black matte finish is trimmed with red and white details. It’s “face” has a blue visor, which makes it look like it belongs in Robocop. Which might not help dispel the notion that drones are makers of a dystopian society, but it still looks rad. When I took it out of the box, I was a little apprehensive. Historically, I have not been very skilled at operating remote-controlled machines. I once got an RC helicopter that immediately crashed into a tree and broke a rotor. So after putting it together—pretty easily, at that—I found an open field and let a rip. And at once, I was amazed at how easy it was to operate. The drone was steady and responsive—far from the erratic arial chaos I was expecting. It also includes a couple automatic features, such as a hover mode for clearer pictures and automatic flip and roll controls, which made me feel like a much more impressive pilot than I am. Somewhat related, the F181 can also take a lickin’ and keep on tickin’. After getting carried away with the auto flip feature, I inadvertently sent my new drone crashing into the ground. I ran to the ground, expecting to already need to buy replacement parts. But to my relief, it seemed no worse for wear. Once I righted it, it took off without much of an issue. And when you’re marketing a drone to novice flyers, durability is a must. Crashing is part of the learning curve. Luckily, Holy Stone had that in mind when they designed this machine. The F181 can be purchased for around $100. And with more advanced drones are selling in the multi-thousand dollar range, you might not expect very good performance from such a cheap unit. While it might not be winning any drone races soon, this has been a perfectly capable unit for my purposes. I’ve already mentioned the hover and roll features, which add a great amount of value to the quadcopter. There is also an automatic home feature to keep your drone from getting lost or crashing when the battery dies. Which is a valuable feature, because the battery life is a meager 7-8 minutes. Good thing they included two. At such a low price, it’s no surprise that there are some issues with the unit. The onboard camera is only 720p, which is a little underwhelming. Its range is also pretty limited—only 50-100m according to the manual. But, since there isn’t an onboard camera display, I don’t mind keeping it within my eye line. The Amazon reviews have a few horror stories: a few motors have caught fire, one person’s drone lost contact with the remote and flew into the distance, never to be seen again. However, Holy Stone’s customer support appears to be very helpful in these cases. Limitations notwithstanding, the Holy Stone F181 is still a pretty impressive machine for the price. Having compared it to machines twice or three times the cost, this unit definitely outperforms its price. Whether you’re just getting your feet wet before buying a pricier drone or a hobbyist looking to have something fun to do, this is a great choice. But, if you’re looking to dive in head first, you’d be better off spending a little more. The Holy Stone F181 Quadcopter retails for $99.99 and it is available on Amazon [affiliate link]. What I Like: Looks fantastic; Easy to control; Very durable; A perfect beginner drone.